Championship new boys Swansea City have confirmed long-time target Mark Gower as their fourth summer signing. The 29-year-old midfielder was out of contract at Southend United and signs a long-term, performance-related deal after joining on a free transfer. Gower ignored other Championship clubs to sign for the Swans as a replacement for Andy Robinson. "We are excited to capture a player with Championship experience," said Swans boss Roberto Martinez. The former England schoolboy international is expected to be joined by defensive duo Albert Serran and Federico Bessone from La Liga club Espanyol at the Liberty Stadium. Has Swans boss Roberto Martinez bought well this summer? Martinez had already completed the signings of Spanish pair Jordi Gomez and Gorka Pintado and Wales international Ashley Williams. And Martinez is excited to have signed Gower, a one-time Tottenham Hotspur trainee. "He is a player who has played a very important and successful role at Southend over the last five years," said Martinez. "The fact that he's chosen to join us with the best years of his career ahead of him is extremely pleasing. It shows how far we've come as a football club. "We all felt, including Mark, he needed a new chapter and challenge in his career and the fans should be excited that they'll be seeing his talents on display at the Liberty. "He can play on both wings, and even in the centre, and is very talented on the ball. He has a fantastic delivery and is great in one on one situations. "He has the gift to win you a football game." Gower - who had a spell at Motherwell and Barnet before joining Southend in 2003 - was a member of the Tottenham squad that won the Worthington Cup in 1998/99. 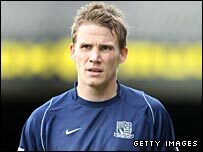 Southend were disappointed to lose Gower and Shrimpers assistant boss Paul Brush said: "We made Mark a very, very good offer. "We truly would have loved for him to stay here, however it is refreshing at least that he has chosen ambition over money and you can't stand in his way when that happens. "He wanted to play at a higher level and we respect that decision and wish him all the very best for the future. "At least we now know where the gaps are in our side now and we will step up the hunt for new signings. "A few enquiries have already been made because we thought Mark might leave, so we will now stoke up those irons in the fire."